And other pictures from a recent road trip to Billings MT. Putting the GS to good use. 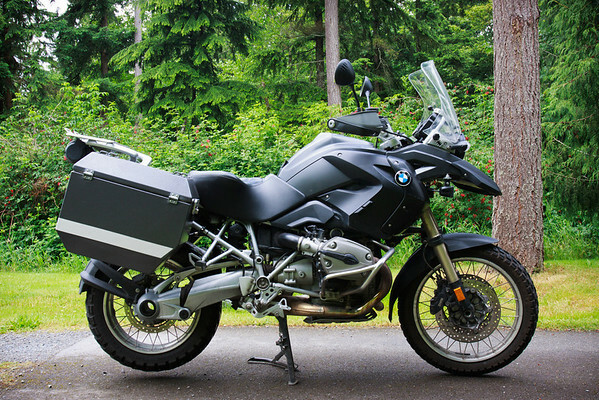 Let’s have some fun with the silver accent trim on the front of the 1200gs with Plastidip. Let's call it the "Double Black"
Ignore the pannier tape, of course, just playing with the front trim here. Could be a keeper. 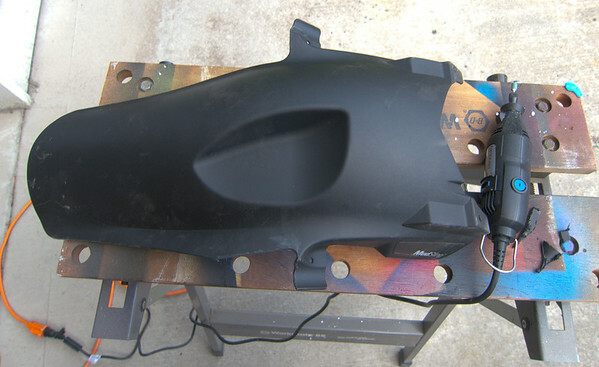 Plastidip available from local hardware store…$6/can. 3 coats, sprayed evenly, 30 minutes apart. Let dry 8 hours. Re-install to bike. Tear it all off if you don’t like the looks. 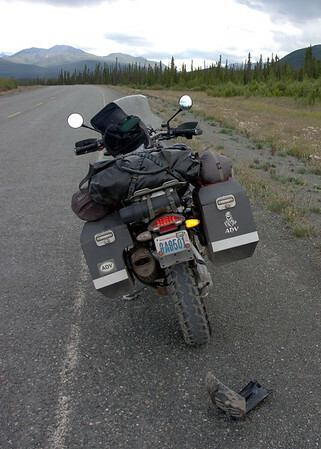 The tipping point arrived after a drizzly morning commute: I dismounted the 1200GS, hefted it up on the center stand, and my gloved hand came off the frame with new layer of road spray that spread to my clothes. A little bit of wet scrappy dirt by itself is no big deal to a GS rider (right? 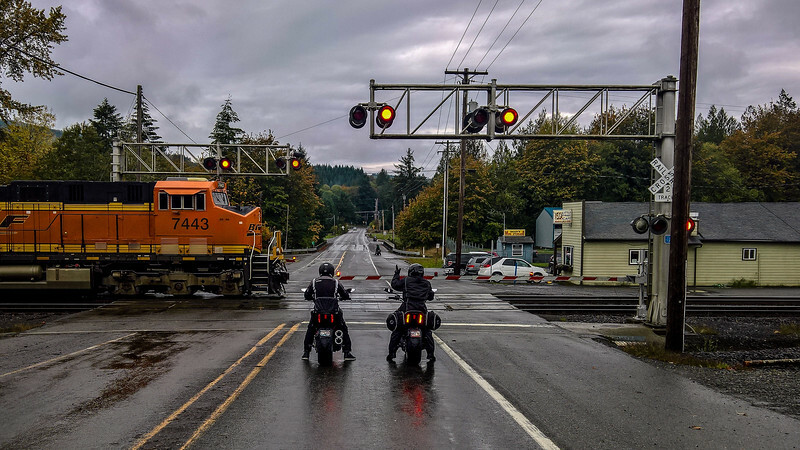 ), the wet Seattle roads were building a grime layer on suit and machine, and it was time to investigate added fender protection. 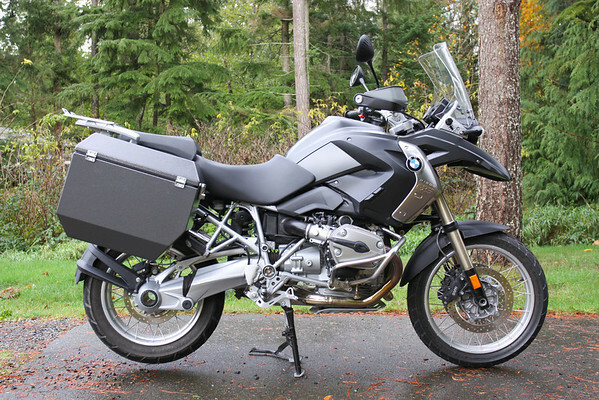 After a bit of industry research, I realized that the fender protection product segment is occupied by an innovator specializing in BMW twins, and a lower priced product with virtually the same specs. The decision point for me was easy: I believe in supporting innovation in the industry, as well as design originality, much like a Kickstarter project. So I went with the MachineArt Moto front/back fender combo. 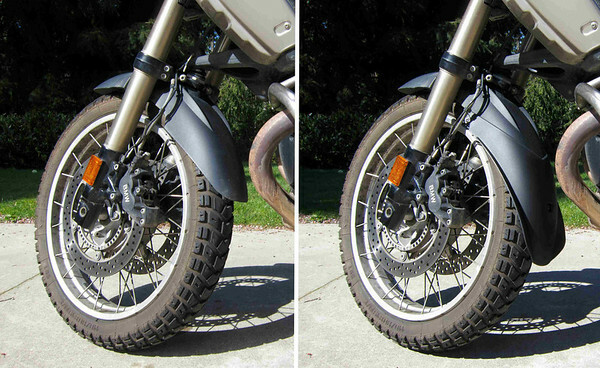 The front fender extension is called the Advant 12, and adds a little more than 5 inches to the back side of the front fender to reduce the spray coming off the front wheel. It installs in about 5 minutes with 3 clips and a Torx screwdriver. I have the Jesse Odyssey II with regular mounts, which means that the left side mount overlaps with a key anchor position on theÂ MudSling MAX. 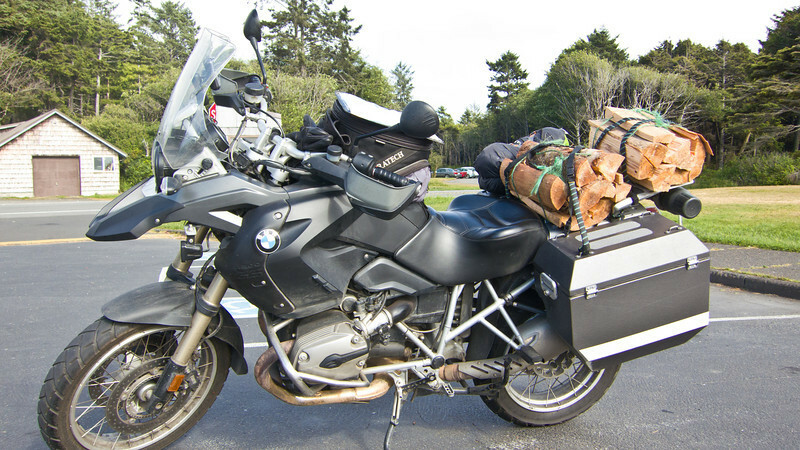 Notice the Jesse bag mount location and MudSling mount area. After a quick consult with Andrew @ MachineArt Moto, I decided to carve out the overlapping segment with a Dremel. MudSling MAX before Dremel surgery. MudSling MAX after surgery. I used the Dremel cutting wheel for the major line cuts, and a small grinder to smooth out the edges. I performed a few back and forth fit/cut iterations before the left side lined up snugly. I attached the two upper screws, zip ties on the bars, and examined the clearance between the extension and the Heidenau K60 tire…about a quarter inch clearance while on center stand, no rubbing while on side stand. Frame bar where I lift theÂ bike onto center stand was dry. My commute takes me through aÂ park with six speed bumps, which I took at various speeds to see if theÂ rear tire hit the fender: no contact at low speeds, some contact atÂ ~25-30mph. 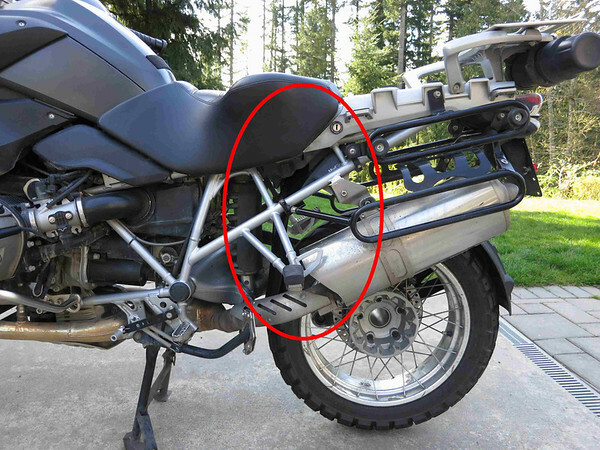 This translates to keeping the rear extender on for all street riding andÂ light off roading, and likely removal for rougher off roading, so I canÂ avoid a repeat of what happened last year on the ALCAN with the BMW rearÂ spray guard. 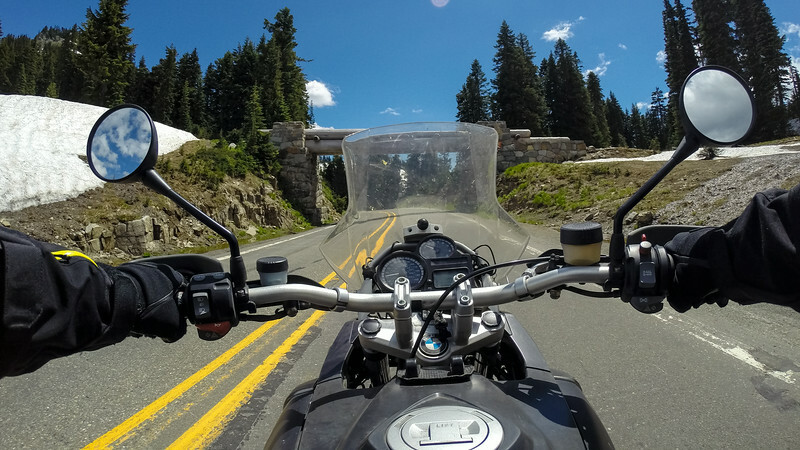 BMW recommends removing the mud guard before riding rough roads. Ooops. Good stuff, glad IÂ did this. Only wish I had these installed on my Alaska trip year, would haveÂ saved a bunch of Dalton calcium chloride from riding up on the machine. 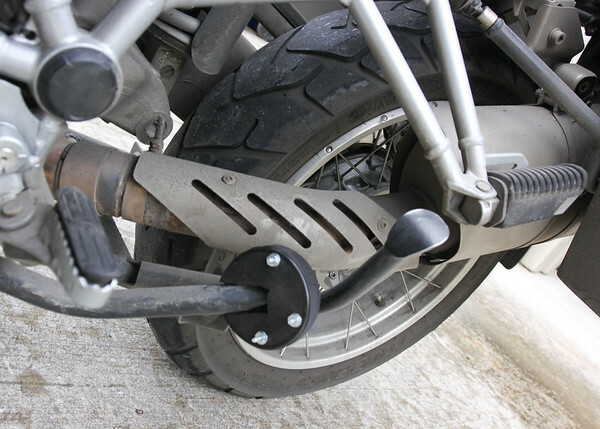 The BMW 1200 GS sidestand is notorious for digging into soft dirt when deployed with a loaded bike, which can result inÂ a bike tip over. Not fun putting a 600 pound bike back upright, evenÂ more of a hassle if you’re solo. 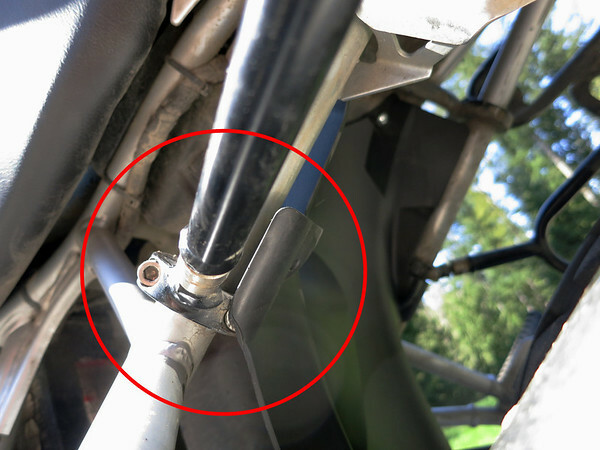 There are several workarounds to prevent a sidestand dig in, ranging from free (coaster on a string) to $30-40 (manufactured metal plate extenders to surround the sidestand base plate). 1) Acquire a puck. They’re $3-5 new in a store, or perhaps you have one lying around. 2) Cut it in half like you would slice off a stick of salami, using a band saw or cross cut saw. No need to be super precise, helps if they are relatively even. 3) Select one half for the bottom, and the other for the top. 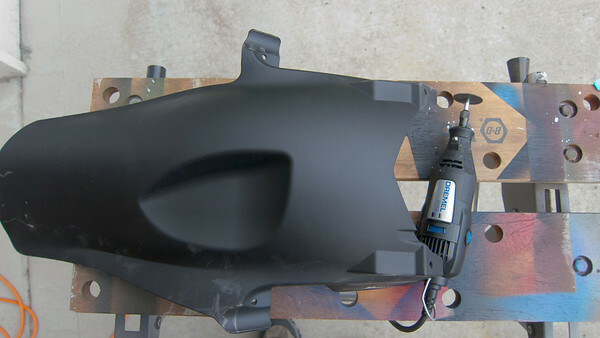 On the bottom half, trace an outline of the sidestand base with a Sharpie. Then carve a slight indent of the outline with a dremel or pocket knife. This will enable the sidestand base to sit within the base. On the top half, carve out a notch for the sidestand arm so that the top and bottom puck halves will line up with each other. After drilling, taper the holes on the bottom of the lower pieces so that the machine screws will sit embedded within the puck. This allows the bike to rest on the puck and not the screws. 5) Attach screws through the bottom half of the puck, and align with the sidestand base. 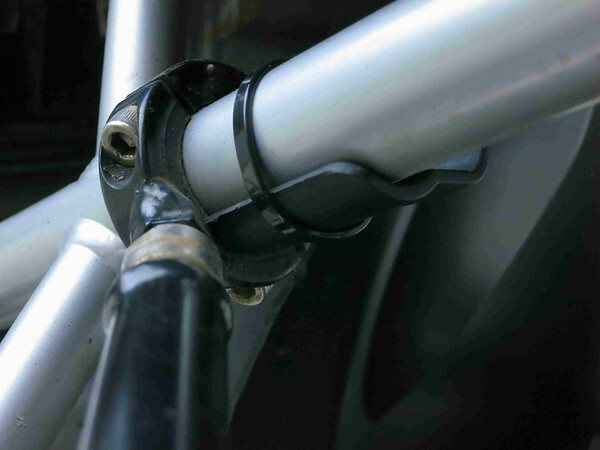 Place top half atop the sidestand, and fit the screws through the top half. This may take some juggling, as theÂ screw hole sizeÂ should be snug and tight with the screws. 6) Secure screws with washers and nuts. Tighten down. Add loc-tite. 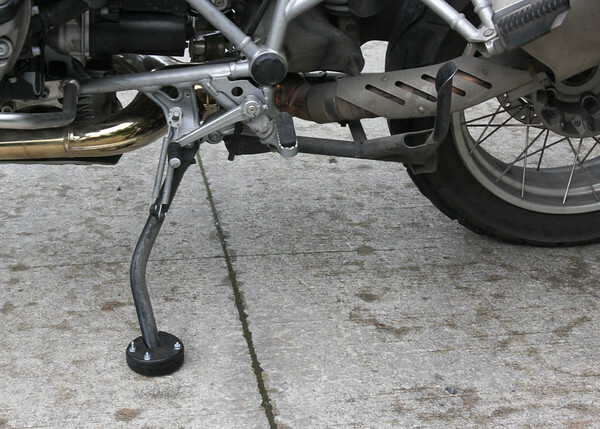 There should be clearance between the puck and the center stand in up position as well as the muffler. UPDATE July 2011: alas, this approach failed after a week of use. 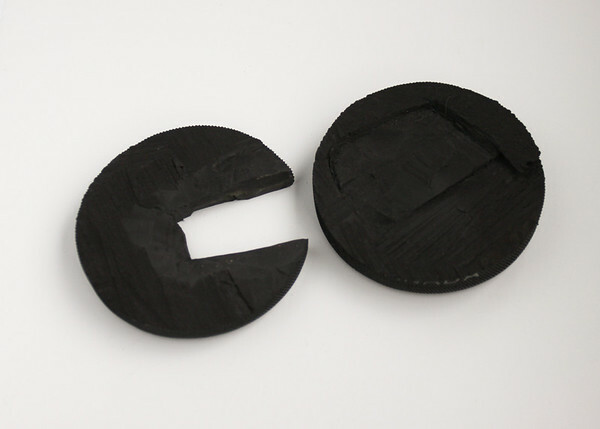 Cutting the puck in half reduced it’s durability, and it shortly broke apart. Moved over to the Touratech sidestand solution, works great.